NEW YORK/LONDON: The amount of time consumers around the world spend online each day will overtake that spent watching linear TV this year, according to new projections from GroupM. In a new report, State of Digital, the media investment group of WPP predicts that consumers globally will spend an average 9 hours 44 minutes with media daily in 2018, up from 9 hours 41 minutes in 2017 (and from 8 hours 50 minutes in 2015). 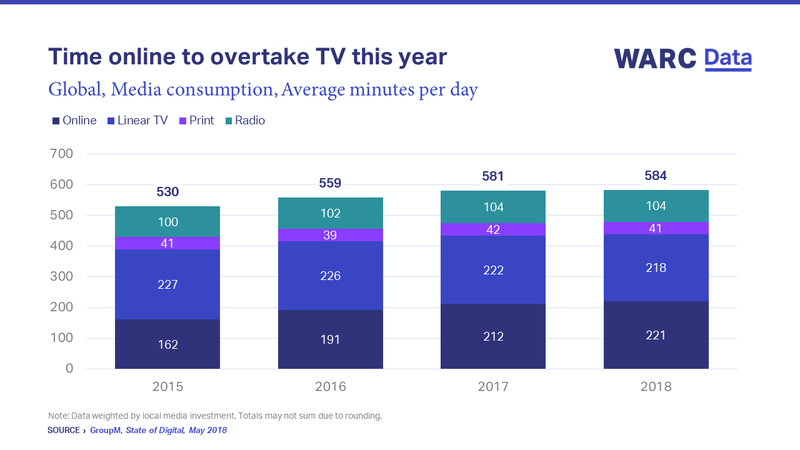 Within that, online media will overtake time spent with linear TV for the first time: online will have a 38% share and TV 37%, with the balance spread primarily across print (7%) and radio (18%). GroupM also examined programmatic trends: on average across reporting countries, 44% of online display investment was transacted programmatically in 2017 versus 31% in 2016. This will rise to 47% in 2018, it forecast. For online video investment, however, programmatic is smaller – at 22% in 2017 versus 17% in 2016 and predicted to rise to 24% this year. Beyond the figures, GroupM surveyed the WPP network to get a take on the various topics that are currently exercising the industry. Blockchain, for example, has limited appeal, since the need to keep every participating computer updated with everything all the time is too slow for a real-time world. Artificial Intelligence, on the other hand, brings not only speed, but analysis at scale of creative or media placement and is expected to develop a role in combatting fraud. “Automation and talent are the big themes in advertising’s current revolution,” said Kelly Clark, CEO, GroupM Global. An overview of average daily time with media, 2015-2018.